What’s Next for the Afghan Elections? The first round was inconclusive. Deal-making could play an important role before a second round is held. 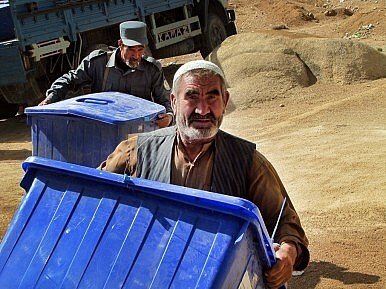 The April 5 elections were, by any standard, a landmark in Afghanistan’s political history. The high turnout surprised everyone. Nonetheless, after three weeks, there is still no a clear outcome. The preliminary results announced by the Independent Election Commission have Abdullah Abdullah with a clear lead at 44.9 percent of the vote. Ashraf Ghani Ahmadzai is in second with 31.5 percent. Incumbent President Hamid Karzai’s choice, Zalmai Rassoul, a former foreign minister, finished a distant third with 11.5 percent of the total vote. None of the candidates have been able to secure the required 50 percent plus to secure victory in the first round. While Ghani seems determined to proceed to a second round, Abdullah has raised questions of transparency with respect to the invalidation of votes by the Independent Election Complaints Commission. The final election result is expected to be announced on May 17, after a complaints clearing process. The Election Commission has indicated that the runoff should be held by June 7. However, given Afghanistan’s historical pattern of deal-making and coalition-building, as well as the post-2001 power dynamics of political networks and powerbrokers, and their ethno-regional voting constituency, one must not rule out the possibility of a power-sharing arrangement that would preempt a second round. Although both leading candidates have rejected any talks of deal-making, the possibility cannot be ruled out. In post-2001 Afghanistan, key ethno-regional leaders and powerbrokers have constituted a political system in which they and their clientele control the Afghan state and the economy through a system of patronage and illegality. In fact, the Afghan state has provided a framework for elites and powerbrokers, where they are dependent on each other’s political and financial resources and power. Each respects the other’s sphere of influence, resources and power within the system. Financially, an investigation into the corruption of the largest bank in Afghanistan, the Kabul Bank, in 2009 revealed, the bank had become a virtual Ponzi scheme for key Afghan elites. As such, the power dynamics of these political networks and centers of power have interlocked them in a system that sustaining the status quo seems to be of utmost importance to them. Viewed in this light, the rhetoric of threat and fear offered by the losing contenders is yet another grand moment of re-negotiation in a system of bargaining and exchange, in which they want to make sure their political and financial interests are guaranteed in post-election system. As such, the elections have provided key elites with an excellent opportunity to re-position themselves within this system by appealing to their ethno-regional constituency. It seems that a power-sharing arrangement is the best political outcome for key ethno-regional leaders and centers of power. Although candidates like Ashraf Ghani Ahmadzai might personally resist such a pact, he is likely to come under immense pressure from the powerbrokers he has made deals with to work towards such an arrangement. At this stage, the possibility of a power-sharing outcome seems to include two scenarios. First, a broad-based coalition of the two lead candidates within which they share cabinet positions and provincial governors. Second, a new power structure to be designed in which the leading candidate could take the highest position and the second contender would take a less powerful position such as a prime ministerial post. The latter would require a change in the constitution with a two-thirds majority consent, which can be achieved by holding a Loya Jirga (Grand Council) immediately after a new president comes to power. In both of these scenarios, what is evident is the important role Karzai will be playing in mediating the negotiations, chiefly to maintain his influence within the next administration. He still exerts a great deal of influence on the Independent Election Commission, the influential Independent Election Complaints Commission, and on the candidates themselves. The absence of a clear winner has further strengthened Karzai’s position. In fact one could argue that there are two explanations for Karzai’s decision to throw his support behind Zalmai Rassoul. Either he made a strategic error in supporting an unpopular candidate or he expected an unclear outcome in the first round, so that he could hold sway and influence as the mediator. Whatever the election results, it is evident that Karzai will play all his cards in order to ensure he remains relevant and influential in the new administration. It is difficult to predict what he has in mind. But in the days to come in the negotiations with the main candidates, he will push for a power-sharing mechanism in which he occupies a position of influence. Even if there is a second round, the results will likely produce a similar outcome and pattern of power-sharing, dictating the need to form an inclusive government. Irrespective of the power-sharing scenarios, the country’s dire economic situation demands an outcome from the first poll. Each round of voting costs more than $100 million. Besides the security challenges and other crucial issues, it remains unclear whether the international community is willing to pay the bills for a runoff. The runoff faces security and political risks. The two rivals should cooperate in avoiding them.